What are the Dimensions of a Balance Beam? 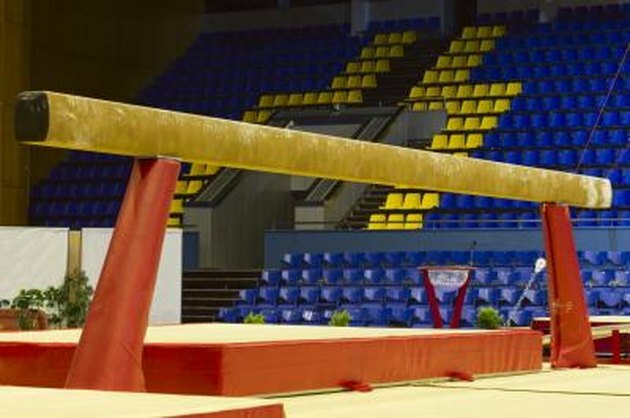 The balance beam, or beam as it is often referred as, is a competition apparatus used by women gymnasts. Once made of wood, today's balance beams are now covered in leather or suede to minimize slipping. The International Gymnastics Federation establishes the universal dimensions of the balance beam; they are 4 inches wide and 16 feet, 5 inches, long and they sit 4 feet off of the floor, supported by a leg or stand at both ends. Strength, stability, flexibility, confidence and control are all required when performing challenging routines on the balance beam due to the narrow surface and high height. As beginners, gymnasts first learn tumbling skills on the floor and then practice on a lower beam that is usually only 7 inches off of the floor. Once comfortable in their ability, gymnasts start to acclimate to the standard beam by practicing basic moves, such as walking, kicking and balancing. Progression leads to jumps and leaps, and then to more advanced moves such as cartwheels, splits, backbends, walkovers and flips.